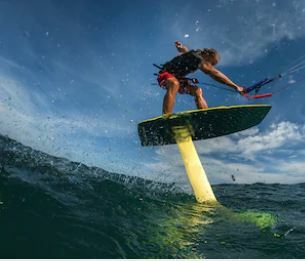 Hydrofoils are wicked fun and a growing trend in the watersports community. Often called Foil surfing or Foiling, some people are calling Foiling the future of watersports. There are many benefits of foiling, easy access to new waves and offshore surf breaks. Foiling is using a foilboard or hydrofoil to surf. These boards are essentially a surfboard with a hydrofoil that extends below the board into the water. A hydrofoil is a long and hydrodynamically designed fin with wings. The board rides above the surface of the water with the foil working in the water. They don’t require anything else just the board. The riding experience has limited friction resulting in higher speeds than a surfboard. Where can you go Foiling? Where there is water you can most likely ride a foil surfboard. You can make the most of the wherever you are whether you are at the lake or at the beach. There is no wave required to get started, just takes some practice to get going. You should ensure that there is a limited number of people around you for safety. The last thing you want to do is crash into another person. Foiling is basic physics and is like an airplane. As you lean back on your back foot, the wing tilts more upright and creates more lift. Then if you apply weight on your front foot, the wing will dive underwater. When you ride you will be in a squat stance and will go through the motions of applying your weight on your front foot and then your back foot continuously to gain speed. Most boards have traction pads that help you with your foot placement. The appropriate stance is to have your chest vertical and shoulders open to maintain your balance. Why the Groove Vest is perfect for Foiling? The Groove Vest is perfect for listening to music while out on the water. And when you foil there is no good solutions to listen to music. The Groove Vest has integrated speakers bringing your music with you wherever you go on the water.